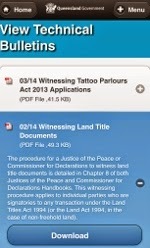 An informal blog site of hints, tips and useful information for Justices of the Peace in Queensland with contributions from JPs all over the state. 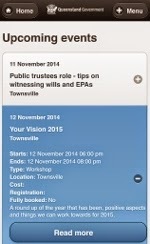 Ceased publication updates on 5 November 2014. 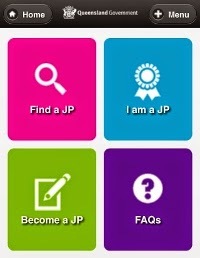 I recently discovered the mobile app for JPs in Queensland and it is another gem from the JP branch. The JP web app provides us with the main services from JPD at our fingertips right there on our mobile phone browser of whatever make and model. Make sure you set a bookmark/favorite to find it again easily. 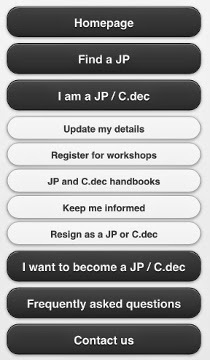 Incidentally the JP App links works equally well on tablets, laptops and desktops. I have added this link to the Useful Links list on the right. As a technologist I have to praise the JP branch for creating a web app that works on all devices rather than the shortsighted route of creating native apps for Android, Apple, Windows Phone and so on, each of which has to be downloaded and updated separately. With a web app you always see the latest version and the app developers only need to work on one version. Please leave your comments and suggestions here. After moderation they will be included in the blog. Michael is a JP(Qual) Queensland working in signing centres on the Gold Coast. He started this blog as a place to store current information and hints on the everyday work of the JP. Feel free to contribute via the moderated comments and email. CC BY version 4.0. Simple theme. Powered by Blogger.